Obama Returns To Booming Elkhart, Indiana, To Highlight Manufacturing Jobs : The Two-Way The president went back to the Indiana town to highlight its economic rebound. Since he first visited in early 2009, the unemployment rate has plunged from about 19 percent to around 4 percent. President Obama speaks in Elkhart, Ind., about the improvement in the area's economy and the role of his policies in the rebound. In January 2009, as the U.S. economy was freezing up, employers were cutting roughly 800,000 jobs that month. President Obama had just taken office and a few weeks later, he headed to Elkhart, Ind., where the unemployment rate was surging to 19 percent. The key problem: Most jobs there were tied to the production of recreational vehicles. In the depths of the Great Recession, few Americans were buying expensive RVs. On Wednesday, Obama returned to Elkhart to tout its stunning recovery and the role his administration's policies played in the turnaround. These days, the community's unemployment rate hovers around 4 percent and employers are facing labor shortages, largely thanks to the RV industry recovery. In 2009, the RV industry shipped 166,000 vehicles. This year, 396,400 units will be shipped, according to the Recreation Vehicle Industry Association. "It is great to be back at Elkhart," Obama told a cheering crowd. After facing "the worst economic crisis of our lifetime," America has rebounded to prove "it's the strongest, most durable economy in the world," he said. Wednesday also brought this encouraging news about manufacturing: The Institute for Supply Management said its monthly report on factory activity showed that of the 18 manufacturing industries covered, 12 pointed to expansion last month. "The solid May ISM manufacturing report is further proof that the U.S. economy is picking up in the second quarter," PNC economist Gus Faucher said in an analysis. "Manufacturing should transition to a positive for U.S. growth over the rest of 2016." The U.S. economy has been in recovery since June 2009 and continues to regain ground lost to the Great Recession. For example, a Commerce Department report on Tuesday showed that personal spending surged 1 percent in April, marking the biggest gain in nearly seven years — suggesting the economy will continue expanding quickly enough to support more manufacturing. But critics say the White House's efforts had little to do with Elkhart's rebound. They credit cheap gas, not federal policies, with boosting RV sales. Dan Coats, a Republican senator from Indiana, said in a statement that Elkhart's resurgence reflects the city's "strong work ethic," as well as "pro-growth policies pursued by the state of Indiana." 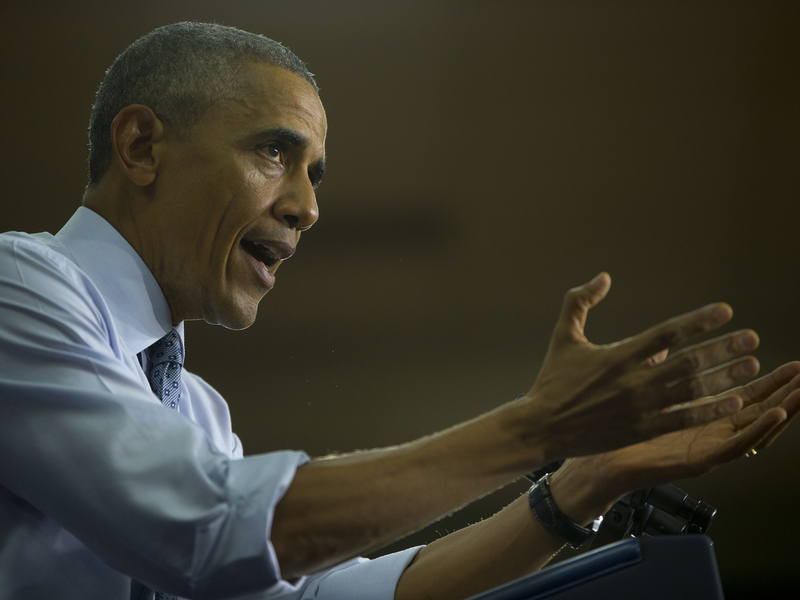 Other skeptics say Obama's efforts fell far short of helping diversify Elkhart's economy. In August 2009, Obama returned to the Elkhart area to announce federal grants to promote job creation through the development of electric vehicles. A $39.2 million grant got absorbed into research efforts and fizzled out in terms of creating jobs. Regardless of what caused Elkhart's rebound, U.S. manufacturing "is making a big comeback," according to Deborah Wince-Smith, CEO of the Council on Competitiveness, a nonpartisan organization of corporate CEOs, university presidents and labor leaders. Earlier this spring, the council, working with the consulting firm of Deloitte, issued a report saying the United States is "leapfrogging China" in terms of manufacturing competitiveness because of investments in new technologies. It predicts that by 2020, the U.S. will move up from No. 2, behind China, to No. 1 as the most competitive manufacturing center in the world. U.S. success reflects this country's "manufacturing investments, a strong energy profile, and high-quality talent, infrastructure and innovation," Deloitte concluded. Still, all of the technological innovations may reduce the need for labor. Manufacturing accounts for about 9 percent of the U.S. workforce, or 12.33 million jobs, up from 11.5 million jobs in February 2010. Still, factory employment is down from the peak of 19.55 million in 1979. While the business cycle can send factory employment nudging up or down, the long-term trend has been down for decades as global competition has intensified and machines and software have replaced workers.